"Ruben Reyes, a volunteer with Catholic Charities, has seen firsthand problems with the new law. Several months ago, he met a grandmother who came to the United States to take care of her U.S. citizen-grandchildren after their mother was deported. She was turned down every time she tried to apply for healthcare coverage or food assistance for the children. They struggled to get by without a breadwinner, and eventually had to go back to Mexico. " Forced to go back to Mexico from lack of hand outs. Too bad!!! "Despite the increase during the first few months of 2010, however, that program also saw a significant drop in applicants from an average of 10,000 per month to 1,334 in January and only 195 in February. " 90% drop in applicants once they became scared of being deported! Hmmmm? The law does work!! 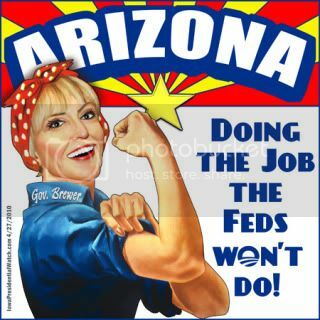 Less burden on the State of AZ!!! No wonder Arizona has no money. Great News!!!! Yet, more proof of the success of enforcement. I wonder why their mother didn’t take them with her when she was deported. Oh, that’s right. . . she can’t use them for freebies in Mexico. "came to the United States to take care of her U.S. citizen-grandchildren after their mother was deported. " Hell yes, she had to go back to Mexico!! I love it. Enforcement in action! At least SB 1070 is serving it's purpose even without all of it's provisions. and then they'll follow accordingly. This is what the other states have been waiting for. Last edited by mkfarnam; 11-25-2010 at 11:05 AM..
even without all of it's provisions. Another outcome of the law is the fact that it helped to wake up many Americans who simply didn't see how the FED prefered to do nothing. Citizens accross the country have started demanding action from their elected reps. Nov was another example of backlash against the the President and his party and how they went against the views of the American public in regards to illegal immigration. Nov,2 was the beginning of the end. That's when the process of elimination started. Either that, or she came on a visitors visa, which certainly doesn't entitle her to apply for any social services for anyone. I don't know why it never seems to occur to illegal aliens to take their children with them when they get deported. As Benicar says though, 'no freebies' in that case.